It’s the beginning of a new week and it’s a good one for me!!! We moved in our new house this weekend and next Monday I’m receiving the furniture for my beauty room! So exciting! I’m planning on posting some pictures when everything is done, would you be interested? Chit chats aside, let’s get back to beauty. I’ve been on the hunt for a good palette that contains enough cheek shades to get me through a trip or holiday, and since I missed the NARS one during Christmas holidays, I was quite desperate. Luckily I went to buy my eyeshadow primer online a few weeks ago, and the new E.l.f. 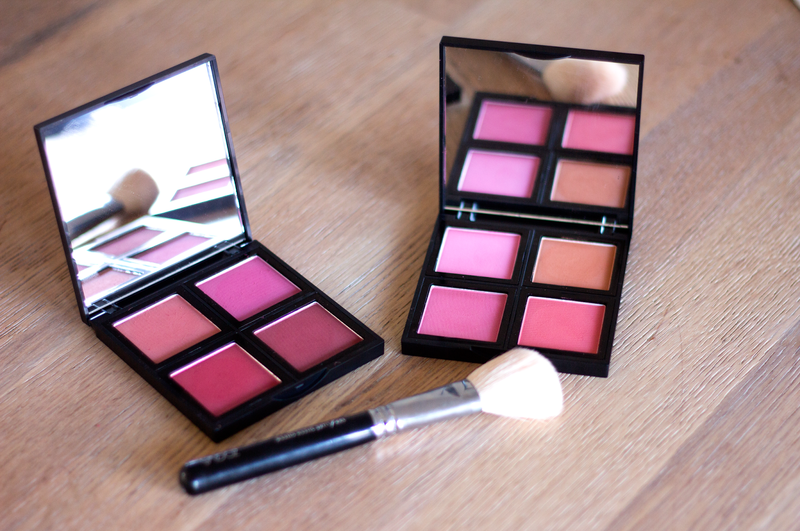 Cosmetics Blush Palettes were finally released in Benelux. I couldn’t wait and grabbed them immediately. The palettes contain four blushes each with both cool and warm tones ranging from pink to peach to berry, some are matte and some have a light shimmer (which doesn’t show up too well in the swatches below, I’m afraid). They are available in 2 different versions, one with light and one with darker colors. Since I loved all colors and knew I would wear them all, I ordered both, and I’m still very glad about it! In the dark palette you find the dark reds and berries and a beautiful deep fuchsia. I wore this one the most in the past days because I find that these colors, the bottom right (last swatch) especially, complement a dark lip very well. 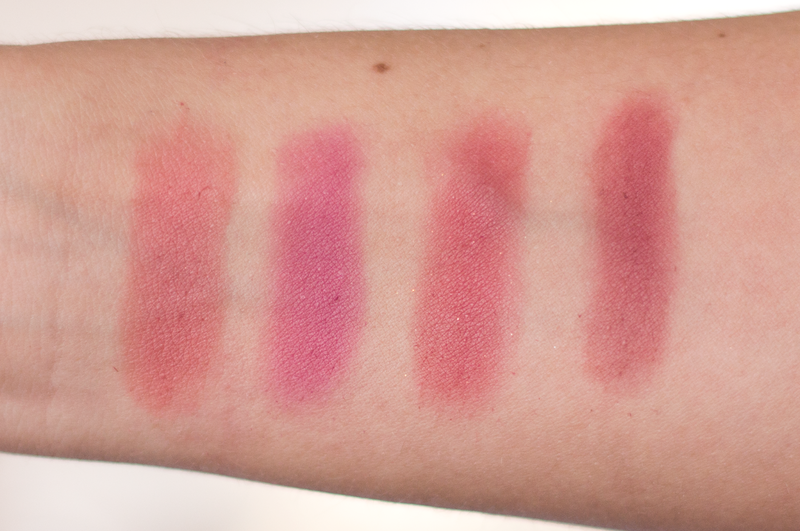 These are all matte with exception for the bottom left one (3rd swatch) which has a beautiful golden shimmer to it. 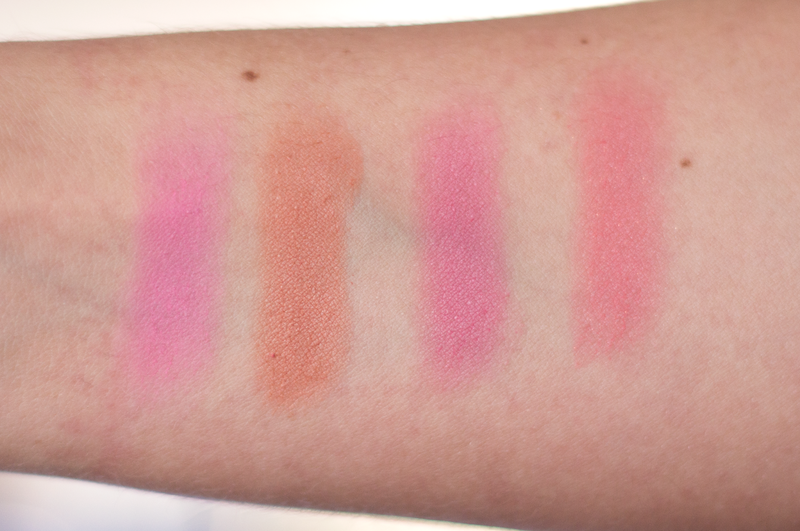 In the Light palette there are more bright colors, two shades of pink, a peach and a coral. These I definitely will pull out as soon as the sun starts shining a bit more. They are the typical shades I wear in the warmer months and I can’t wait for it. These palettes are from E.l.f.’s Studio line, and just like their single counterparts, are of great quality. They are highly pigmented, soft in texture and long lasting just as i expected them to be. Furthermore, the pans are extractable, which means you can mix and match your palettes and bring with you the colors you prefer. Such a brilliant system! You can find these on their website for 6,80€ each, such a bargain! Have you seen these already? Do you have any E.l.f. blushes?